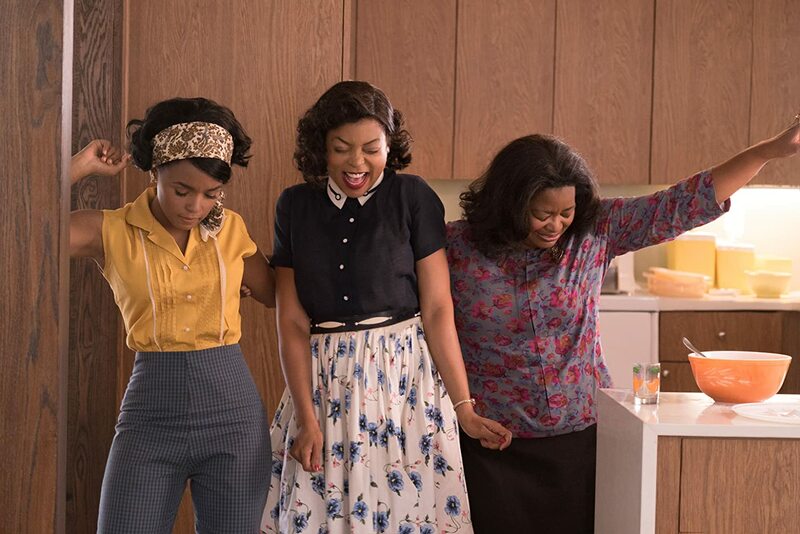 Melfi’s movie is based on a true story and focuses on three black women who broke tradtional gender and racial barriers working at NASA to send John Glenn to the moon. 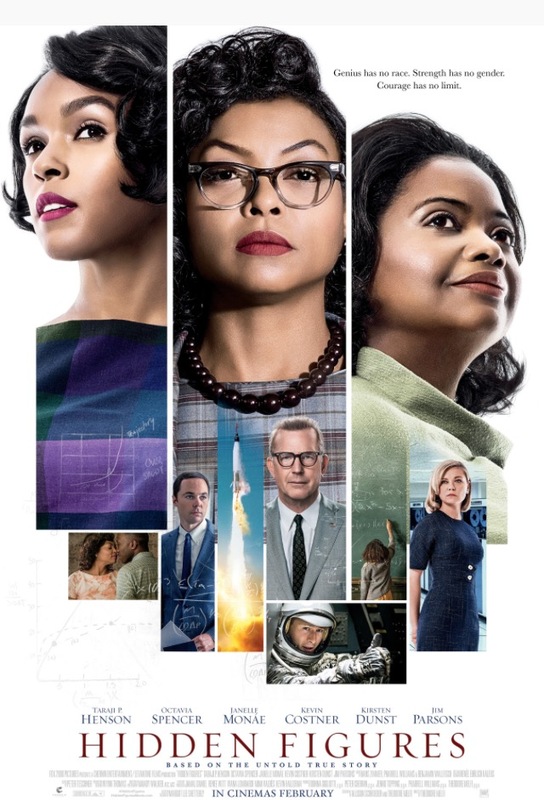 Katherine Johnson (played by Taraji P. Henson), Dorothy Vaughan (played by Octavia Spencer) and Mary Jackson (played by Janelle Monae) were the focus of the film. My favorite character was Katherine (depicted below). In the room where she was working, all the other men had on similar white shirts and ties, which helped to create a contrasting look between Katherine and them. My favorite part of the movie was watching Katherine’s character have to walk half a mile to go to the bathroom. The only colored bathroom was in a different building. It is not something that many would think about, and was surprised watching it on the screen. Katherine had to walk far just to go to the bathroom and eventually, her boss Al Harrison (played by Kevin Costner), asks her why she takes a long break every single day. Octavia Spencer’s character, Dorothy, was also good to watch. She acted as a supervisor for the colored computers. (Before digital computers, people who did calculations were called computers). She worked hard to get her people to work on the IBM computer that was being developed. 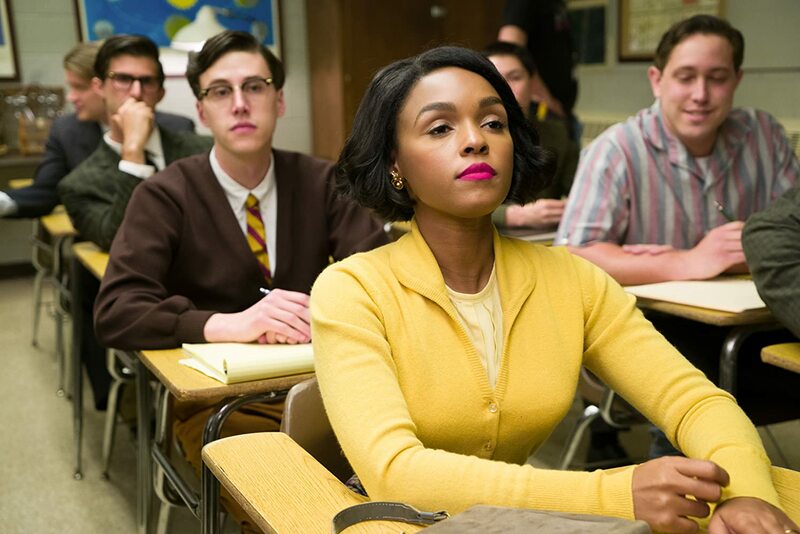 For me, an interesting part of the movie was when she tried to go to the library to get a book on the computing program used by the IBM, but was turned away because she was colored and the book was in the white section. Mary Jackson’s character was my least favorite. I felt like she was often the least important of the three and that she deserved more screen time and more of a development. 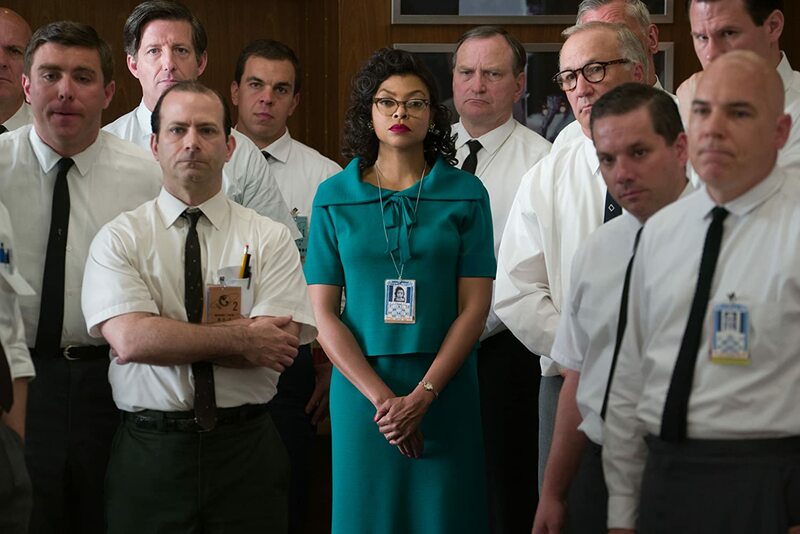 She ends up winning a court case to study at an all white school so that she could become an engineer at NASA. Overall, I think this is a movie that everyone should see. I love how it was based upon real people and real events because, as the title implies, not many people might have known about these women before watching the film. Let me start off by saying that I personally loved this movie. I love Jackie Kennedy and I felt that the movie was very good at artistically presenting her. I cried during the film and was impressed by a lot of things that I had not thought about. 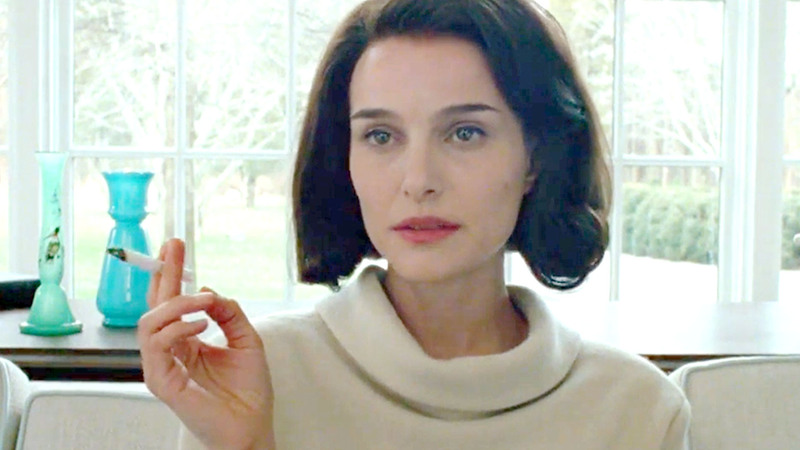 This movie was about Jackie Kennedy (played by Natalie Portman) in the days during JFK’s death and burial. The focus is on her, more specifically, how she deals with the loss of her husband and shapes how he is remembered in history. The most shocking thing about the movie for me was watching her shower after her husband was assassinated. It isn’t something that many people think about, but Jackie did have to wash all the blood off of herself and this scene depicts it well. Another thing that Lorrain does well is the filming. The movie is shot in mostly extreme close-ups, which make the movie often uncomfortable to watch. Additionally, the lens used is different from most films. This creates a grainier picture could sometimes be disorienting asnd added to the uncomfortable nature of the film. Moreover, the film is shown in a non chronological way. This makes the movie more meaningful because events are portrayed as they are significant. The focus point of the movie is an interview between Jackie and a reporter and events are shown as flashbacks as she is recounting everything to the reporter. Another scene that I enjoyed was the White House Tour. 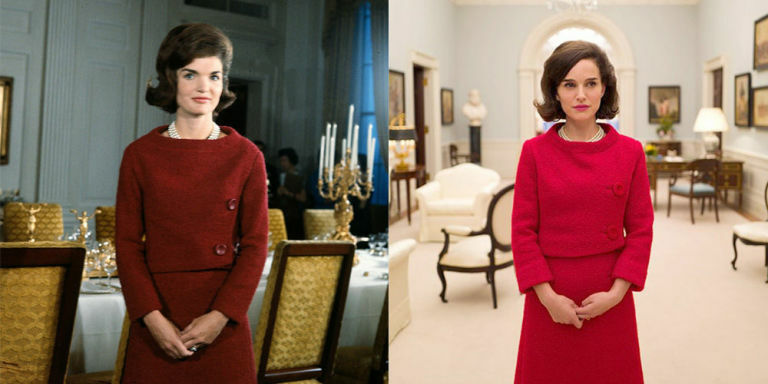 Shots of the real Jackie Kennedy are intertwined with shots of Natalie Portman, but the effect is seamless. The same exact words and camera angles used during Mrs. Kennedy’s real White House Tour are used in the film. Although this part of the movie seems irrelevant to the plot, it shows her relation to Abraham Lincoln’s wife. Kennedy knew what happened to Lincoln’s wife when Lincoln was assassinated and did not want the same thing to happen to her. In fact, in the movie Kennedy says that she wants to sell the furniture to be able to put her kids through school. Lincoln’s wife has sold the White House furniture to make ends meet and Kennedy was afraid she was going to suffer the same fate. Overall, I would recommend this movie to anyone who doesn’t mind watching an upsetting film. A grieving widower is drawn into a custody battle over his granddaughter, whom he helped raise her entire life. I felt that this title was incredible lacking to the plot of the film.First of all, it focuses on Kevin Costner’s character, the grandfather. It does not give much detail regarding the granddaughter, or the custody battle. Is this an example of Hollywood whitewashing and male dominance? Secondly, the title already seems to present a bias to the viewer. It strongly favors Kevin Costner’s character and does not shed light on the other side of the custody battle. In this case, the viewer who reads the IMDB summary will already have an inherent bias. This movie works to improve race relations but relies heavily on stereotypes to do so and therefore does not achieve its desired goal. The black grandmother (Octavia Spenser) for instance, is a traditional “mammy” character as Ella Shohat and Robert Stam, in their article “Unthinking Eurocentrism”. She is the one that “provides the glue that keeps the household together” and can also be considered a “sassy black lady”, another stereotype in film. The film also portrays the black father as a drug addict and the white father as an alcoholic. The film plot is especially driven by the difference in size of the families, with the grandfather’s family just being himself and Eloise, and the grandmother’s family being full of aunts, uncles, and cousins who all live on the same street. Although the goal of the film is to show that things aren’t “Black or white” as the name of the film implies, the stereotypes shown in the film make the film very black and white. 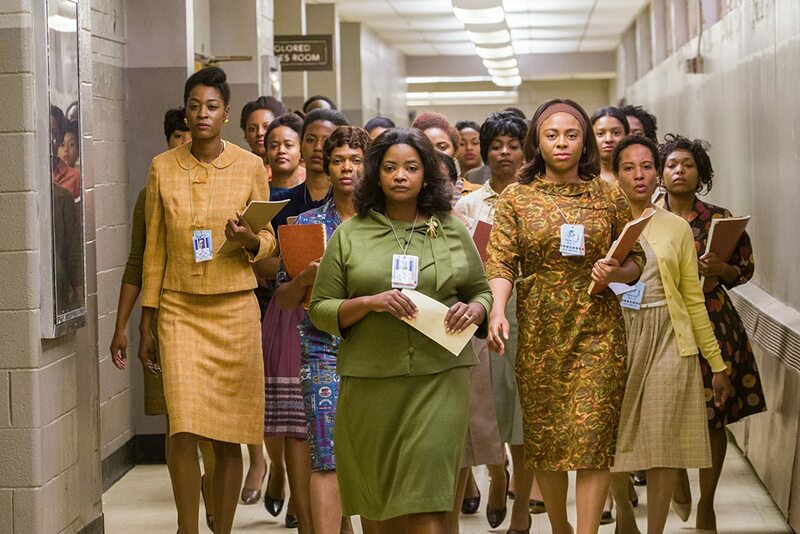 In many films, even today, women are underrepresented. For instance, films that portray women do not give them as many speaking lines as men. Carpentier, in her article, discusses how in the movie, “Mulan,” the dragon had more speaking lines than Mulan. Clearly, Mulan is the most important character in that movie, but because she is a women she is not given as much attention. This is largely becuase most writers and directors are male. Films that do feature women with large speaking roles are largely known as “chick flicks.” In other words, movies that are enjoyed by both men and woman must have predominantly men speaking characters, but if the movie focuses around women, then the movie is for woman only. Budd Beotticher remarks that the role of women in a film is to represent something for the male character. Does she inspire love in the man? Does she inspire him to act a certain way? In every instance, the man serves at the end goal. In fact, Laura Mulvey, in her article, “Visual Pleasure and Narrative Cinema” argues that directors position women in shots to serve the purpose of having the man be the end goal, but women the visual support. 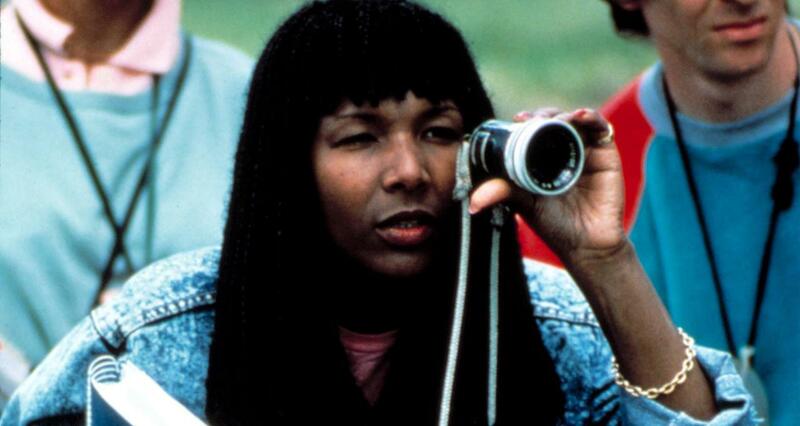 Most people are not surprised when they see women without large speaking roles in cinema. In fact, many people criticize movies when they show a strong female role. For instance, when the new Star Wars film came out, many people complained that Rey was the focus point of the movie, because for many it was unbelievable that a female character had an integral role in the film. Euzhan Palcy, writer, director and producer from the French West Indes. Alice Guy, first female director. This movie follows the story of Jose and his grandmother, who works in the sugar cane fields. His grandmother wants him to attend school and do well so that he has a better life than she did. An important scene that encompasses this feeling that the grandmother has is when Jose is telling his grandmother that he received a full scholarship to the school. There is a cut away to Jose’s hands and he is counting the money. Then there is a wide shot of him talking to his grandma while putting on his clothes. Then, the boy leaves and there is a medium close up of the grandma who is reflecting on the fact that she does not have to do laundry anymore. The lighting isn’t great in the scene as most of the light seems to come through the house from the outside. I felt like this scene is significant because it shows the relief of the grandmother. The grandmother would do anything to help give Jose and education but was unsure if she, despite all her efforts, would still be able to provide her grandson with the money he needed to go to school. Her sacrifices had taken a toll on her and this relief was especially pleasureful to watch. From the late 1960s to the mid 1970s, Hollywood existed in a pre-blockbuster golden era. This era of film making contains many of my favorite films including Mike Nichols’ “The Graduate”, John Schlesinger’s “Midnight Cowboy”, Martin Scorsese’s “Taxi Driver,” George Roy Hill’s “Butch Cassidy and the Sundance Kid” and George Roy Hill’s “The Sting.” However, I had never seen any of Cassavetes’ films until watching “A Woman Under the Influence.” During this time, films emphasized realism and rejected traditional rules for dialogue. Thomas Doherty, in his work, “Hollywood’s Pre-Blockbuster Golden Era” calls this era of film making “a New Hollywood Renaissance that matched the best of the classical era.” Many of the films of this time were more realistic and improvisational. John Cassavetes’ film, “A Woman Under the Influence” encompasses this era of film making. The film follows Nick, a city construction worker, and his desire to help his crazy wife Mabel and their 3 kids. The film is very dramatic in a serious way. The instances where there is the most tension in the film, like when the doctor comes over and Nick’s mother is present are not unlike something that would happen in real life. The instance where this is most obvious is a the party Nick threw for his wife. Nick is really happy that his wife is coming home and invites dozens of people to celebrate. Nick’s mother advises him that there are too many people and she tells them to leave. As Todd Berliner, in his article “Hollywood Movie Dialogue and the “Real Realism” of John Cassavetes”, remarks, the mother’s speech is abnormal for cinema and more accurately reflects real life. She does not communicate effectively nor speak flawlessly. Instead the mother changes direction and emphasis in her words, going from a loving tone, to a more demanding tone and back to a more loving tone. Here it reflects real life because she changes what she is saying as she is saying it. Cassavetes really accomplishes the “blending of art and reality” as Todd Berliner describes. The success of the movie lies in this bending. The movie’s reality makes it much more provocative and though inducing whereas a more traditional studio film would not leave as much of a response. Overall, I would recommend the film to others who want to understand how film evolved from early cinema to the blockbuster hits that we see today. I really enjoyed Varda’s film because I felt like Cleo was a really fun character to be following. I could relate to her stress and frustration when she was getting the tarot cards red and related to her happiness when she went hat shopping for instance. I also enjoyed the pace of the movie. A lot of times a movie will condense time to fit the hour and a half time frame but this movie was not compressed all that much since the story happens only over 2 hours. Enough happened during those 2 hours that enabled it to fill an hour and a half and not feel boring. I chose to analyze the final scene because I really like the ending. The scene opens with a wide shot of Cleo and the soldier sitting on the bench talking. Cleo seems very happy and not as stressed as before when she was in the hospital. She knows the soldier is leaving and wants to live in the moment. The next shot is a extreme wide shot. I loved the angle of this shot when I was watching it because at first I didn’t know what to look at. It is nice to see it from the perspective of the man on the bench. Next, a close-up of the doctor in the car is here. I really liked how this shot is a bit long. The camera is still focused on the doctor when Cleo and the soldier are talking. It brings a slower pace to the scene as the camera is not flipping back and forth as they are talking and makes the focus of this part of the scene the doctor, and not Cleo. Finally, a wide shot of Cleo talking to the doctor is shown. Here is where the focus shifts from the doctor to her.She is relieved that the doctor had good news. Next we see an extreme wide tracking shot. Here it seems as though the camera is on the car as it is driving away.I thought that this shot did a good job in applying depth and perspective to the scene in a rather quick way. Lastly, a long take close-up of Cleo and the soldier is shown. This scene reminded me of the very last scene of “The Graduate” where Ben and Elaine are sitting on the bus looking at each other and smiling. Nichols probably got the idea for that from Varda. Here, they are both happy about the test results but also serious and not sure about the future because the soldier was about to leave and Cleo still had to go through chemo. I feel like their emotions are the same as Ben and Elaine in “The Graduate” so it is kinda interesting that the last shot for both films are the same. That ending in Nichols’ film has become an iconic ending but it seems like the inspiration for that came from this film. This blog was created by Sara Monahan for her film analysis class and the weekly posts show her reflections on the film assigned that week. Hope you enjoy! Movies & Popcorn Create a free website or blog at WordPress.com.